What the heck? When did I have a kid let alone one that has been around for an entire year? Half the time I'm still surprised when I remember that he's mine and I'm not just watching him for someone else. Planning a birthday party on the other hand was something I've done before. But planning for a baby was a definite new one. 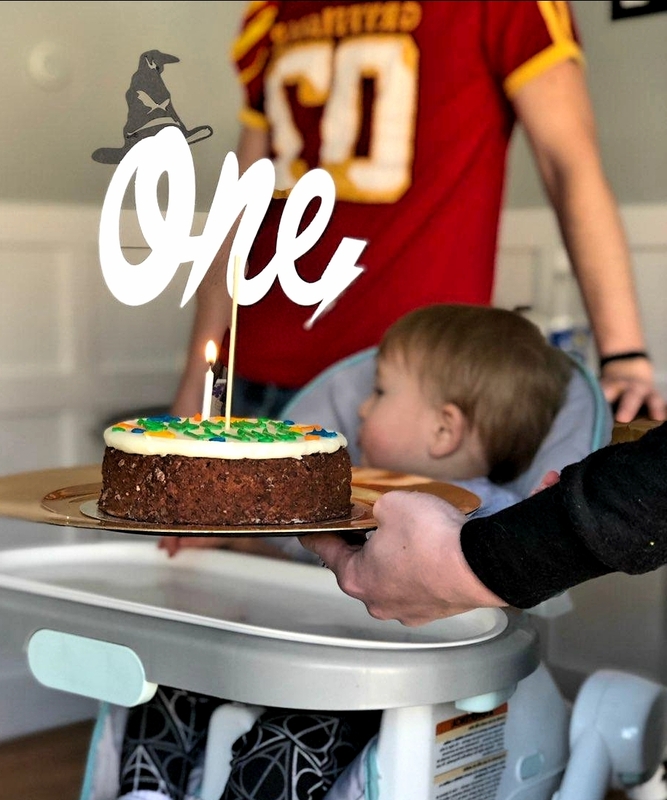 We did a Harry Potter-esque party for the little guy because, first of all, Harry is the best, and, second, I wanted it to fit the theme of his birth announcement which also happened to be Harry Potter. I'm a nerd. Feel free to judge. So. I tried to keep it simple. I really did. I was originally going to try and make everything myself but... Life. Christmas hit and medical stuff decided to join in and I found myself in a splint and post surgery on my hip and hand. Etsy to the rescue! I purchased his invitations, clothes, cake sign, even some of the signs from that site. The first thing I found was the invitations from SwiftDesignByMadison. She was super accommodating and even changed the wording a little bit because... I'm a crazy English major and an editor and I thought it flowed better. Second were these adorable clothes. Seriously. I need a me sized version of the leggings. And the Gryffindor tie shirt from GagaKidz. All of the clothing held up really well despite a toddler running rampant in them and multiple washings. And they're still freaking adorable. Third I found this awesome sign from SunshineGlitterStore for his cake. He didn't really get the concept of blowing candles but he thought the big thing on the stick was pretty cool. Lastly, these quotes from BJOdigitalPrints were an instant download file. All I did was print them out and then cut black poster board to make "frames." My sister made the signs that labeled the parts of the castle to fit with what we were doing/eating. Ok now for the ramblings. Keep reading if you desire. The goal was to have an entire backdrop of signs, sayings, and cut outs from the Daily Prophet which were just going to be taped to the wall. Super easy. But NOTHING is easy once you have surgery on your hand. And this was the second time I've done this. I should know better. The end result was sparse but no one cared. They just enjoyed the food and had fun talking. For food we did sandwiches and cake pops. Even that had to be rushed at the end. I didn't have time to cool the chocolate properly or put a sealing coat of frosting on them and then freeze them before dipping them in the chocolate. So they ended up a little lumpy and misshapen. But again I plead maimed hand. I didn't want to just have a cake sitting around because, and this is a secret folks, I don't really like cake. I'd go for cookies any day. But it's a birthday. And you've got to have cake. In hindsight it would have been much easier to just have a cake with a golden snitch on top in gold sparkles but... It all got eaten so that's all I cared about. My favorite part was the "potions class." I had lemonade in the fountain that people could use as a base for their drink mixes and a myriad of other flavors to choose from. That area got a lot of attention which I enjoyed. Anyway that's enough of the drivle. What do you think about this craziness. I liked it but I'm partial. Anyone else do something like this? Let me know!